In the town where I went to college, there was a place that would make salads to order. The place was stocked with every sort of ingredient one may want on a salad (and a few ingredients that I had never thought to add). However, it was expensive (a negative for a college student) and now I live many miles away. 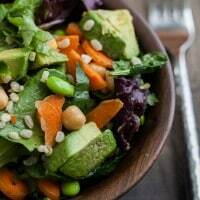 For some reason, I’ve always had a disconnect with salads, until recently. I had this strange mental block of making these one bowl salads that would keep a person full for hours. My salads were mainly veggies with a sprinkle of cheese and some dressing. I could never emulate the salads from my college years. The change came when I started keeping leftover cooked grains and legumes in my fridge. One day I said, “why not add brown rice to a salad?” And that was that- I began my journey of one bowl salads. If any meal radiates positivity and energy, it’s a big salad. 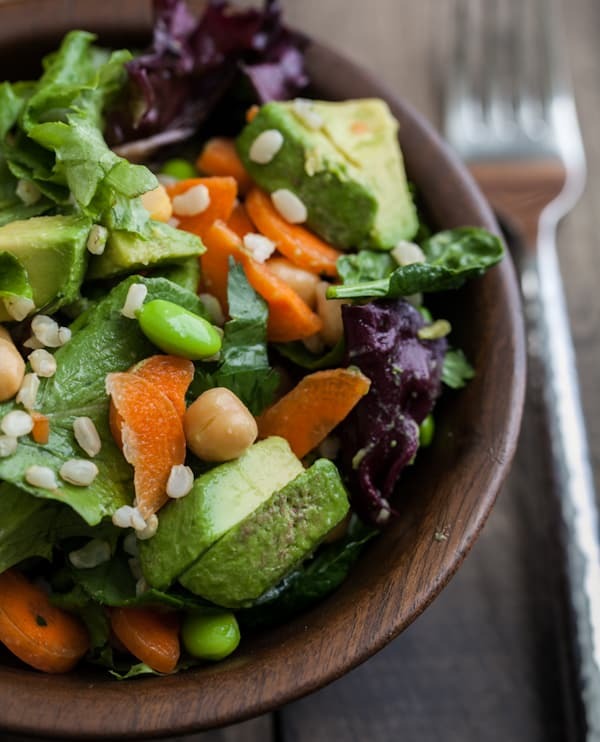 Chop the carrots and avocado into bite-size pieces. 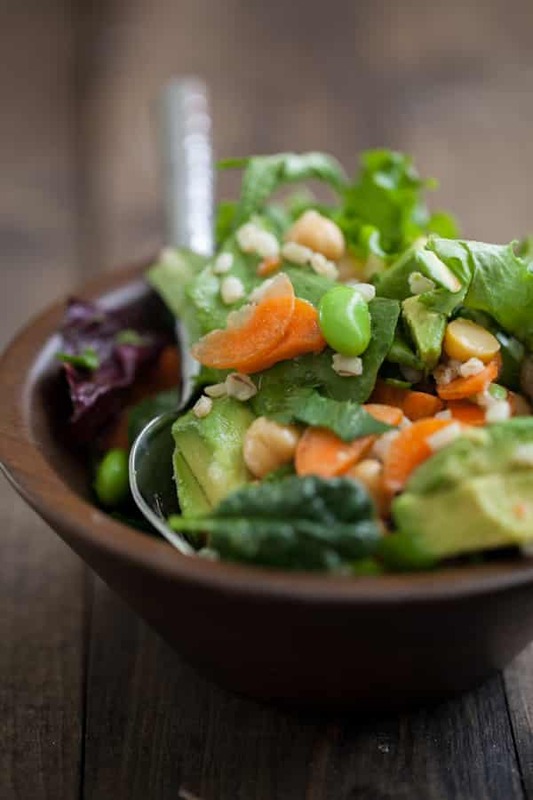 In a large bowl, combine lettuce, brown rice, edamame, carrots, avocado, chickpeas, and goat cheese. In a small container with a lid (a canning jar works great), combine lime juice, walnut oil, cilantro, and honey. Shake well until combined. Pour dressing onto salad and toss well. Love the colors. So pretty! we’re growing edamame, carrots and cilantro in the garden this summer…this will be a keeper for sure – many thanks! Tempting indeed! Thanks for the recipe. 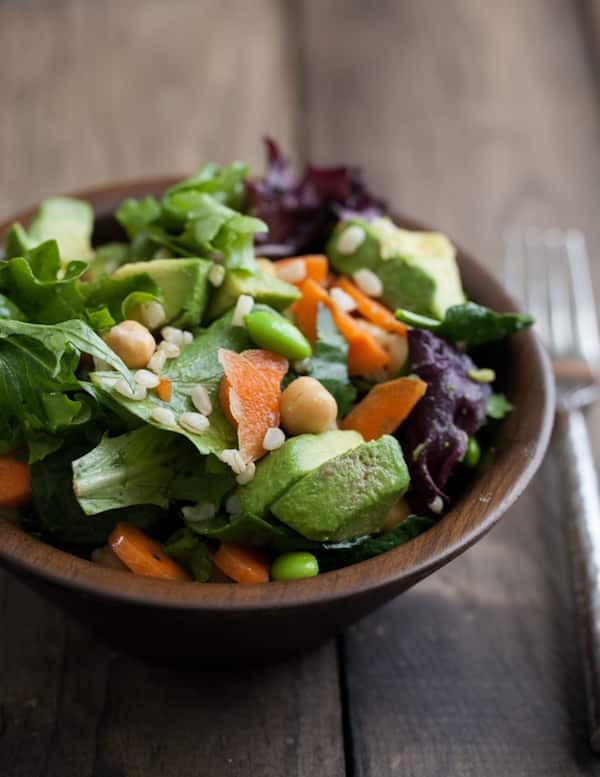 I need to start making salads like this – I always view salads as sides that aren’t very filling. But they can be so much more! Thanks for always being so inspiring. This looks/sounds amazing. Great flavor combo. This was totally the inspiration for today’s lunch. Left out the grains and used TJ’s cilantro dressing instead. Amazingly yummy and fresh! Thanks! This is just the kind of thing I love to eat at lunchtime. The coriander (sorry, Brit here!) dressing sounds so good. I love the simplicity of a big salad. I really do crave them in the summer and get so excited to make big, farmers market salads this time of year. Edamame is a fun addition! I love the flavours of lime & cilantro (well, coriander on these shores). And I imagine the honey adds a warm, sweet accent. 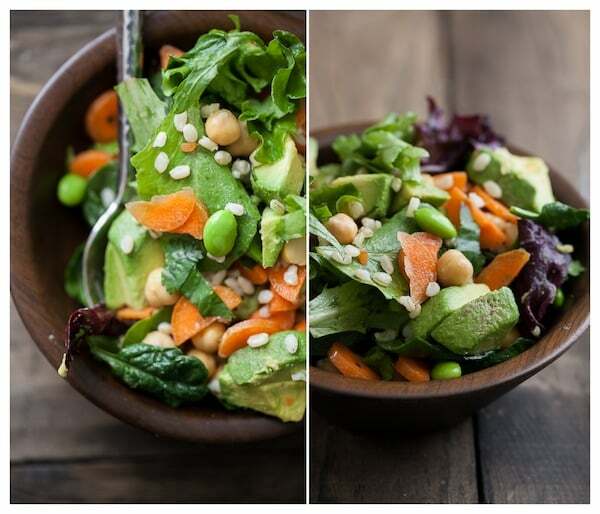 The dressing is every bit as important as the salad! Can’t wait to try this lovely example. yum! what a lovely recipe! This is totally how I cook. I always try to add something pickled, preferrable fermented, to my salads along with whatever leftover grain or roasted veggies I have in the fridge. Nuts and dried fruit are nice too. It’s great that you share such simple, real life recipes. I appreciate them! looks like my kind of salad, nice and hearty and no lack of protein. I bet some quinoa would be great too. Had this for supper tonight–very satisfying and YUMMY! My meat-eater husband loved it too!